1 photograph : b&w ; 9.5 x 13.6 cm. This photograph depicts, from left to right, Jeannette, Alexander, and Romey McDonald standing behind Sarah McDonald, who is sitting in the chair, and Angus McDonald, who is sitting in the grass. 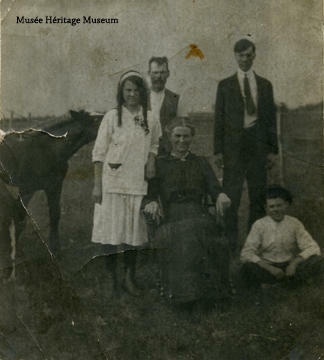 The photograph was taken outside in the farmyard at River Lot 8 in St. Albert. Christina [Tena] McDonald is absent because she was the one taking the photograph. A copy of this photograph is also in the St. Albert Historical Society fonds, 2003.01.1994.